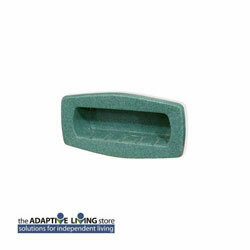 Recessed Soap Caddy, 15" x 8" x 4"
Recessed Soap Caddy for installation in our Low Profile Shower Units. Outside Dimensions 15-1/2" x 8"
Inside Dimensions 13-1/8" x 3-3/4"
Please Note: Caddy & Shelf Accessories are custom ordered. Once in production, the order cannot be changed, refunded, returned or exchanged. Please confirm your order with an Adaptive Living Representative.